Om, I bow down at the lotus feet of my Guru!! 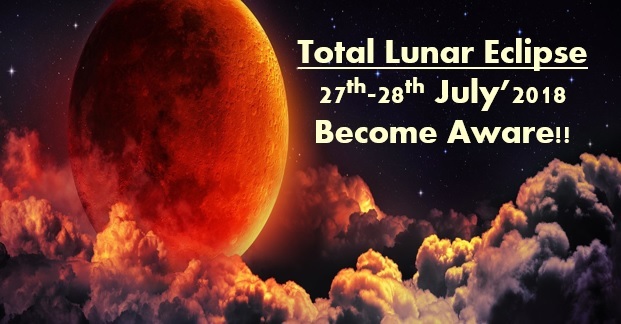 This is going to be the 2nd lunar eclipse of this year and its the longest lunar eclipse as Moon will be under the complete umbral shadow of earth for almost 1 hour and 43 minutes. Since, its Full Moon and Lunar Eclipse occuring at the same time when Moon's power will be at its peak and yet it would be undergoing an eclipse, there are certain points which one must remember at this time and consider before we witness this phenomenon and its impact on our mind; the thought process. Full moon is considered to be a time when the emotions, the inner feelings of anxiety & worries rise and oftenly people feel a great rush of emotional turmoil inside them during the full moons. A sudden rise in the expression of anger, depressed feelings & upliftment in the feelings of aggression are very commonly seen among many. People usually complain during the period of full moon that they are experiencing the feelings of "cry & weep out". Even many people begin to introspect during the period of full moon as there is an increase in the thought activity during this period and one thinks deeply about- "why am I thinking so much? ", "Why all these thoughts are hovering over my head?". This makes them think a bit more deeper than the routine busy thinking process. For the sadhaks & for the people who follow a spiritual regime, this period is a very important period of practicing sadhna, kriyas and meditation. This full moon is certainly more important as it is Guru Purnima and it hold great significance for the people who have Guru in their life or the ones who are a part of a lineage and under the divine guidance of Guru; certainly a very auspicious day to celebrate. Now, this full moon is slightly heavy for the people who have Moon placed alone in their horoscope or those who have moon placed in any of the water sign or debilitated moon (certainly a water sign) as this reflects upon the deep thinking and leads to emotional overflow. Because of the Total Lunar Eclipse, the emotions will overpower such natives and one can witness a great amount of anxiety, worry, sleep deprivation, sudden aggression in their behavior. This is further backed up by the retrogression of mercury which will not lead to any sort of clear communication but unknown confusions in any small argument even. Specially, the natives with the placement of moon as mentioned above, will face issues of misunderstanding, verbal fights, even cold wars which are based on internal dialogue of anxiety and a sense of detachment would be experienced as Ketu is involved in conjunction with this full moon about to undergo eclipse but let me add here, retrograde mars too is a part of this trio, so, there can be sudden burst of anger, if these natives are poked back & again. Mars & Ketu together form the energy of eruption with blast; so, it can be considered as the blast of emotional frustration too. People whose work involve fire need to be very cautious while working, from 26th to 29th July and this includes the women working in the kitchen too. Capricorn & Aquarius natives need to be aware while signing any legalized document or they may just avoid any legal proceedings during this period and also, any verbal argumentation or conversations which involve a fiery speech should be strictly avoided, not going to be in your favor at all; there can be losses in reputation. Now, what else can be done to mitigate the impacts of this huge rush of energy which is going to flow over from tomorrow. Take a look:- 1. You must meditate upon Lord Shiva in the morning & evening. 2. You can chant His mantra on the rosary or on the karamala- "Om Namaha Shivaya". 3. Let me give you a trick, you can put a mark on your hand or wear a ring or a raksha sutra by conveying to yourself that- "I will be aware of my thoughts & my words and I will not involve in any unwanted discussion with anyone." This will help you to become aware of your thoughts & actions. And, this has worked fabulously for many- many people. 4. Receive blessings from your Guru as its Guru Purnima and Guru's grace always works as a shield in the dark of dark phases of life. 5. Observe fast on 28th and it should be total fasting; without even consuming water, specially if lunar eclipse is visible in your city. For kids, elderly & patients, there is always liberty of consuming as per their necessary diet. 6. For the women who are pregnant, they can recite "Durga Saptashati" and specially "Devi Kavach." 7. Those who are initiated in a lineage, they can chant their initiated mantra and receive blessings from Guru. Meditate & become aware of your own thoughts and take thoughtful actions. Happy Guru Purnima and Good Wishes to all of you! !